Christmas wreath photo by Joe Shlabotnik. The lovely Garden House on 15th Avenue South (it’s listed on the National Register of Historic Places and is the oldest house on Beacon Hill!) 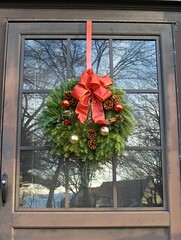 is the site of a Wreath and Swag Workshop on Saturday, November 15, from 10:00 am – 2:00 pm. Tickets are $20, and you will leave the workshop with either a swag or a wreath. Materials are included. More details and ticket purchase information are here. The Garden House is located at 2336 15th Ave South.